Either it is a property you want to sell or an apartment that you would like to rent out, it can be extremely difficult to stand out from the crowd of million other real estate ads. Being a successful real estate agent (or a player in the real estate industry) does not only mean knowing it how to sell a property. Creating attractive marketing campaigns, delivering it to the right audience and generating leads especially crucial to stay on top of the game. But how to find the audience for your campaigns? Can easily translate to how to sell a house if you have noone to sell it to? Luckily there are just almost as many buyers (and renters) as available property on the market, you just need to make sure you find the right people to show your ads. As you might have also realised time of newspaper and TV ads, even billboards are over. Facebook Ad targeting, with its 2.27 billion monthly active users is one of the most potent tools in your marketing arsenal. Targeting those advertisements correctly, however, is a critical step in the process that can transform the way you connect with your clients. Unlike the traditional methods of billboards, radio, television advertising, ads on the social media giant are not only visible no matter where your customers go, they also are significantly cheaper, reach much larger audiences, and are far more efficient. Facebook ads also offer very granular targeting, although without the right tools and methods they could cost your company a lot of money, and fail to put your advertisements in front of the people they were designed to reach. While a well-designed Facebook Ads campaign could do wonders selling your real estate, a campaign that fails to reach your target audience could stunt your return on investment. In addition, when you consider the total investment that your company makes on an ad campaign, you must factor in not only what you spend on the Facebook Ads themselves, but also the time and effort it takes to conceptualise these ads, design them, draft them, approve them, etc. One of the first things you want to do is to set up some location targeting based on the region where you are selling property. You do not want to get overly precise and target only within a one-mile radius, since people may be moving from other locations, however also try to focus on a catchment area of 25-30 miles. Also advisable to target zip codes that showed a tendency to move to the area where you are selling in the past. Age targeting is pretty self-explanatory - target the age ranges that most likely will buy your property. It is important to practice common sense here as there is no use in showing your ads of a $2 million mansion to an 18-year-old who likely does not have the budget to purchase or the other way round, if you are looking to rent a studio apartment, you would probably focus on students or young adults. However the actual income targeting option was removed, you can still use an income estimation percentage based on zip codes. You need to navigate to Detailed Targeting and type Income and you can already choose from the available options that you think might best apply to your property. Other demographics targeting might help excluding people who recently moved, so are less likely to buy a new property and move again. Just navigate to Detailed Targeting and type Recently Moved and you could exclude people who updated their home address in the past 6 months. Even though Facebook offers some interesting targeting options, there is no guarantee that just because you get your location and age group right, the people who see your ad actually are interested in buying property. This is where the Audience Finder by 42matters come into the picture. As it turns out tapping into the applications people have installed on their mobile devices gives you a very good insight of what these people are interested in and based on that you can build an incredibly incisive audience persona. For instance, if somebody has real estate listings plus mortgage apps on their phones you can be fairly certain that they are looking for real estate to buy. Quality is king. One of the many shortcomings of running an interest-based advertising campaign on Facebook is that people are not necessarily committed to the things they “like” on the platform. Indeed, people are far more interested in the content of the applications they have downloaded on their phones. After all, applications take space. So, if they don’t actually want them, they don’t download them. By building audience personas with the Audience Finder you are advertising to people that have committed to their applications. As such, they are far more likely to be swayed by your advertisements. Step Two: Export Your Custom Audience. This step is fairly self-explanatory. Once you have selected all the applications that define your audience, export the list to your Facebook Ads account. To broaden your reach, Audience Finder will automatically create a lookalike audience. That is, one that matches the profile of the list you created. ‍Step Three: Create Your Facebook Advertising Campaign. Once you have exported your custom audience list from the Audience Finder to your Facebook Ads account, you are ready to finish setting the parameters of your advertising campaign. Make sure to include the lookalike and to test different bigger lookalike sizes especially if your ad frequency is getting too high. 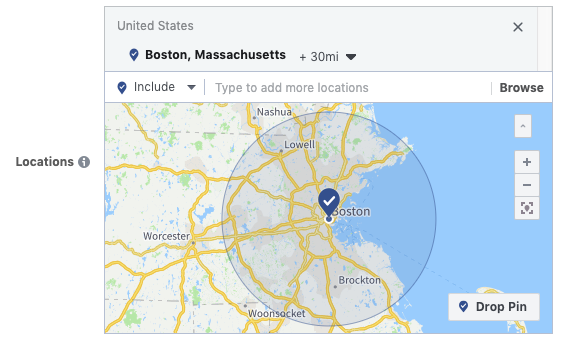 To define your audience as specifically as possible, we recommend adjusting any of the standard location, demographic, and interest-based targeting tools provided by Facebook. The obvious step would be here to set the location in the vicinity of the physical location of your real estate and to target an audience within an appropriate price range - if it is a big family house, probably a higher age range would work best, if it is a studio for rent, try to target younger/single people. Real estate business in the 21st century is an extremely competitive game and only the most up-to-date and tech-savvy can stay on the very top. The Audience Finder by 42matters can help boost your real estate listing's visibility by using information about downloaded mobile applications to more reliably identify your customers’ interests. This granular approach to audience targeting is guaranteed to put your advertisements directly in front of consumers no matter where they go. By using the Audience Finder in conjunction with Facebook Ads, you will be better positioned to reach your customers. In addition, you will be able to outflank your less tech-savvy competitors and assure that the time and money you spend on advertising is fundamentally contributing to revenue. If you want to see how a real estate marketer used the Audience Finder successfully already, check out our use case on the subject. Half of American Facebook Users show interest in Fitness and Wellness, making it a massive target you can use. Find out how can you take full advantage of this opportunity in your marketing! A collection of tips on how you can find your ideal target audience for your Facebook Ads. These days, people have more dining options than ever before. So how do you make sure your restaurant stands out? In this article we’ll walk you through the various ways Audience Finder by 42matters can be deployed alongside Facebook Ads to boost your mobile orders and drive more brick and mortar visitors.